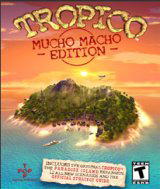 Tropico Mucho Macho Edition is the definitive Tropico compilation, including the original Tropico, the Paradise Island expansion, 12 all-new scenarios, the official Brady Games strategy guide and an in-depth making-of featurette. Comments: You can get involved and found its a very addititve game. Easy to learn an fun game. You can build structures. The game allows you to be a good ruler or turant, was fun try both ways, i highly recommend it.